1) The specimens mentioned above individually share some morphological features with their fellow members, but not with all. And they also share some features with different species from previous and subsequent time lines. 2) Starting in the 1990s, 7,000+ hominin fossils dated to 430 Ka have been found at Sima de los Huesos in Atapuerca. 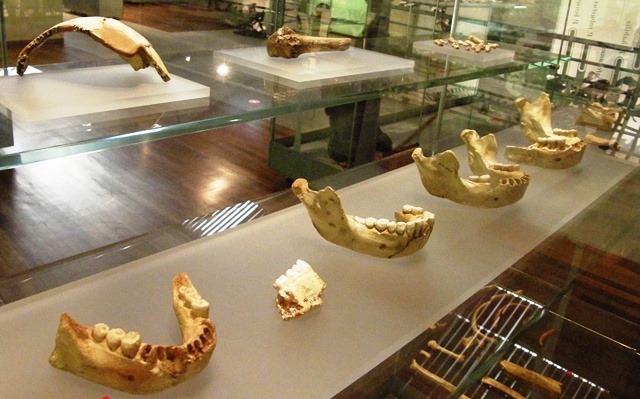 They constitute more than 80% of the total hominin fossil record of the Middle Pleistocene. They were initially assigned to Homo heidelbergensis, but later the paleogenetics analysis demonstrated that they have a close relationship with Homo neandertalensis. Therefore, in 2014 the Atapuerca team argued that those hominins do not belong to H. heidelbergensis. 3) One classic position used to be the consideration of Homo heidelbergensis as the common ancestor of Homo sapiens and Homo neanderthalensis. The relationship with H. neanderthalensis could be related to their robusticity, large brain case and facial features. For example, most Middle Pleistocene mandibles share some neandertal derived features. However some dental morphological traits are different from those in neandertals. 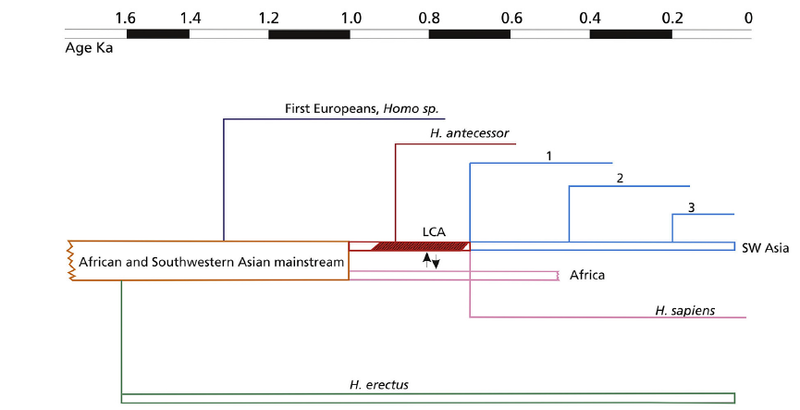 Alternative hypotheses place Homo heidelbergensis as a Western European niche, while the African fossils are assigned to Homo rhodesiensis. 4) The type specimen, the Mauer mandible, has not actually typical features of the rest of supposed representatives of the species. Some researchers see the Mauer mandible a unique specimen, while others defend some similarities in the teeth between Mauer and three partial mandibles from Arago. Many researches actually recognize a number of features in the Mauer mandible as neandertal-like. In particular, in the ESHE 2016 meeting Rosas argued that the neandertal lineage should include the Mauer mandible: when comparing Mauer with Arago and Sima mandibles, they share common patterns such as the broad rami, the preangular notch and the position of the mental foramen. So, what’s up with the Homo heidelbergensis name? According to the most recent paleogenetics studies, the split between the neandertal and the modern human lineages occurred between 550-765 Ka. 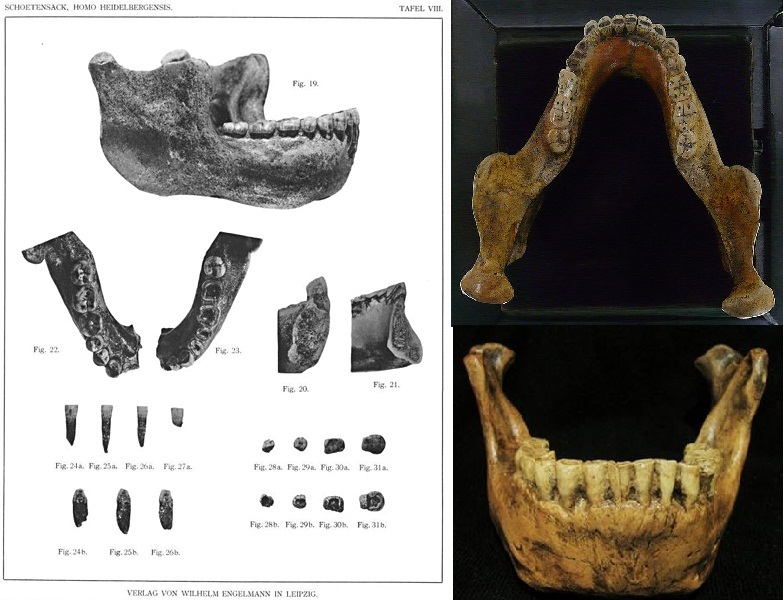 The Mauer mandible dated to 600 Ka is the oldest Homo heidelbergensis, and other specimens traditionally assigned to H. heidelbergensis are more recent than that. Both considerations imply that H. heidelbergensis cannot be the common ancestor of neandertals and modern humans. The settlement of the European continent is a passionate topic. The samples show a large amount of variability but, once the neandertal morphology pattern is achieved, then a lower level of variation in observed. There are many questions to solve. Was the variation a consequence of several events of first bottlenecking and then hybridization, or both? What was the scale of such events, wide or local? The drastic climatic changes can probably explain scenarios of isolation of some of the populations, the extinction of many, and the hybridization of the remaining. A probable demographic discontinuity occurred between the late Early Pleistocene populations c. 800 Ka and the Middle Pleistocene populations c. 600 Ka. The generalized and primitive morphology of the TD6-2 mandibles suggest no direct relationship between Homo antecessor and the European Middle Pleistocene hominins. These specimens share a derived neandertal pattern (Mauer, Arago, and Sima de los Huesos mandibles), not present in Gran Dolina. However all of them may have had a common ancestor during the late Early Pleistocene. Skeletal parts from TD6 suggest some phylogenetic relationship with the Middle Pleistocene European hominins and the classical neandertal. The morphology recalls some features from Southwestern Asia specimens. That common ancestor could have evolved there, and then an early dispersal into Europe could have resulted in the Homo antecessor found at TD6-2. This is also compatible with the above-mentioned paleogenetic results showing the split of the neandertal and modern human lineages between 550-765 Ka. This event may have also occurred from that common ancestor. During this transition, for 200,000+ years the climate conditions may have resulted in several groups’ extinction. Meanwhile, new migratory flows into Europe may have taken place, as well as hybridization between the remaining groups which explains the morphological similarities. More information: Continuity versus discontinuity of the human settlement of Europe between the late Early Pleistocene and the early Middle Pleistocene. The mandibular evidence (Bermudez de Castro et al, 2016) [access]. The slideshow above ‘The controversial Homo heidelbergensis’ is available to download [here]. Esta entrada fue publicada en Actualidad y etiquetada Homo heidelbergensis, Middle Pleistocene, Pleistoceno Medio. Guarda el enlace permanente. “..this structure, located at a region on chromosome 16 designated 16p11.2, first appeared in our ancestral genome about 280,000 years ago, shortly before modern humans, Homo sapiens, emerged. This organization is not seen in any other primate – not chimps, gorillas, orangutans nor the genomes of our closest relatives, the Neanderthals and Denisovans. Yet today, despite the fact that the structure is a relatively new genetic change, it is found in genomes of humans the world over.